OPEN TUESDAY & WEDNESDAY (7am-6pm both days), closed Thursday, and OPEN as usual Friday (7am-6pm) and Saturday (7am-4pm). 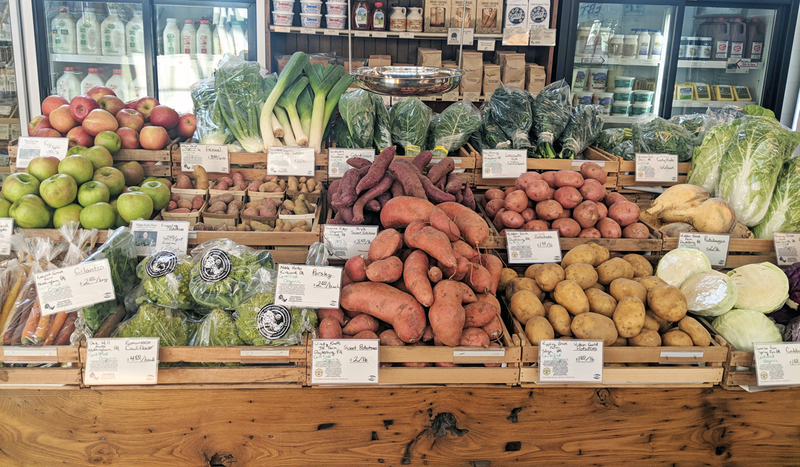 Outside of the beverage category, highlights this week are sweet potatoes, purple sweet potatoes, collard greens, curly kale, butternut squash, romanesco cauliflower, and Brussels sprouts. Of course we’ve also got lots of regular ol’ potatoes, onions, cabbage, and loads of other wonderful fall/winter veggies. We’ve got great stuff for gifts, too: Calicutts spices, Torchbearer sauces, and Epic Pickles are all big hits. Gift cards available, too! This is now our third Thanksgiving at the Broad Street Market, and my third Thanksgiving blog post. My gratitude is year-round, but I appreciate this annual reminder to not only be conscious of it, but to speak and express it “out loud”. In gathering my thoughts for this evening’s post, I re-read what I wrote last Thanksgiving, and found that I don’t think I can say it better. So apologies if I sound like a broken record. I remain, though, deeply grateful for the opportunity to be at the market, doing what we do, part of your lives, and you part of ours. I am grateful to live in an area of such beauty and such natural abundance. For the land that yields our food. I am grateful for the farmers who work that land and bring us the fruits (and vegetables) of their labor. I am grateful for this city, for its people, for its placement so near land and farms and farmers that can sustain it. I am grateful for this market, for its rich history, and its recent resurgence. I am grateful for our customers, who come into the city, who fill the market, who buy the vegetables that the farmers grew on the verdant land. I am grateful for Dusty, though he’ll complain about me including him here, for pouring himself into Radish & Rye, and for being a wonderful partner at work and at home. I am grateful for the community we find ourselves in; for the hundred interesting and heartfelt conversations we have each week with growers and with market-goers; for the cooking tips and recipe ideas; for the stories; for the laughter. I’m grateful for the trust you place in us, and for the support you’ve given us. And new this year, I am grateful for the group of people we now have working with us — Veronica, Justin, and Marie. As I write, Veronica and Dusty are getting the stand ready for tomorrow, and Justin will arrive before dawn to finish setting up. Not long ago, Dusty and I were 100% of Radish & Rye, but now we would not be able to do it alone. The people — farmers and market-goers — have always been my favorite part of this job, and now I’ve a third group to include in that — our staff. I am grateful to have such a kind, competent, fun, and cool group of people supporting us and working with us (and I hope you’re enjoying getting to know them, too)! There are also a number of other varieties frozen, including a selection of breads from Talking Breads.